James Neiss/staff photographerNiagara Falls, NY - Greenhouse Coordinator Bob Bracikowski, center, works with program participants Connie Greer and Elizabeth Greene. 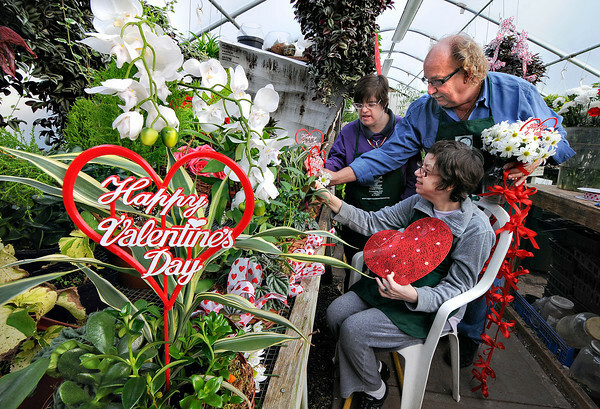 The Niagara Floral Center & Greenhouse at Opportunities Unlimited of Niagara is selling a variety of Valentine's Day arrangements, including a Box of Carnations for $20, Bundle of Love basket for $25 and Lasting Beauty green planter basket for $25, that can be ordered by phone at 716-504-2617 ext.244, or online at http://www.opportunitiesunlimited.org/index.php/greenhouse/store. Orders must be made by Wednesday, Feb. 4, with a selection of pickup dates scheduled.